From the kiwi coastal streets of Wellington, to the pot-holed road edges of Islamic Abu Dhabi, and after a romantically frantic cycle over Parisian cobblestones and through struggling post-colonial corners of Cape Town, I find myself on Birkegade – ready for a new understanding of public space, democractic design and the further ignition of my passion for sustainable urbanism and how? with people. Shaping Cities With People, arki_lab style. I’m from Wellington, the small and isolated capital of New Zealand. I’m in my third year of undergraduate studies at New York University in Abu Dhabi. At the Middle Eastern campus, i’m studying a degree called Social Research and Public Policy, within which I focus on sustainable urban design. A practical and flexible degree; my studies guide me through the complexities of how to collect data on people and how policies can make the public realm a better place. Public space is my passion, sidewalks in particular. I love learning what public space means, how it manifests itself in various regions of the world and how data can help us improve it. I’ve lived on every continent except Antartica, studied the streets of over 30 countries, feel “local” in Paris, Cape Town, Udaipur, New York and I find myself back in Copenhagen. Why? As fresh and tantalizing as it’s food scene, Copenhagen offers an invigorating palette of urbanism and design. It’s streets are filled with people and hope. I wanted to live surrounded by residents that embrace their civic space and learn why, how and where they learnt to do this. At some point, Copenhagen went through a fundamental shift and is now a more extroverted and proactive city than any other I’ve studied in the world. I believe the quality of living all starts with the human centric urban design. The humanization of Copenhagen’s city centre is in keeping with the Danish style of democratic design where things are built to be used by everyone. This sense of community is important for urban resilience in times of climatatic strife, I wish to learn how the Danish foster this shared mentality and look to use it as a guide to improving other cities. Not as a copy-paste situation, but as a process. Arki_lab is pioneering as facilitators of this collaborative process, whether in the development of strategies, analysis or design. I came to understand their user-involvement strategies and the tools they have developed to activate and engage these different actors. Democractic design is put into practice here in this arki_Laboratory; true to it’s name, my work here feels like an exploratoration and projects are succeeding experiments. Urban design is the art of changing cities to follow new patterns that better meet our challenges while also improving our quality of life. To do so involves a complex balance of powerful stakeholders, thousands of deeply invested ideas, environmental justice and cultural awareness. 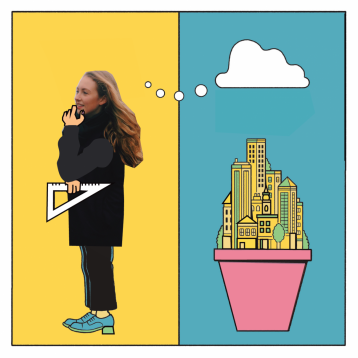 As an aspiring urban design student, I want to learn and witness how this balance plays out in the real world- and I believe that arki_lab is the perfect place to that!